29 years ago football was hit by one of the game’s greatest tragedies. 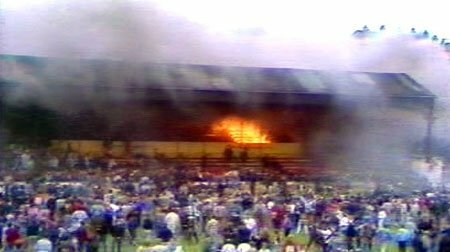 The fire at Bradford City’s ground, Valley Parade. 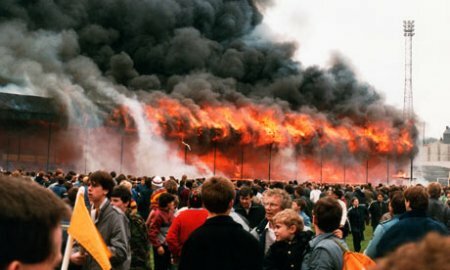 I have covered the anniversary of the Hillsborough disaster but the Bradford disaster has become the forgotten disaster to hit football in this country. The fire took the lives of 56 fans of both teams. It also left 265 injured. It started in the wooden Main Stand when, it is thought, a lit cigarette was dropped. This ignited rubbish that was built up under the stand over the years. This then spread to the actual stand itself. It was a tinder-box. A tragedy waiting to happen. Exits were shut, or locked. Fire extinguishes were not present because of possible vandalism. most of the victims were discovered trying to escape via these, locked, exits. The only good thing is, this is the 80s you have to remember, there was no fencing to prevent pitch invasions and hooliganism. Watch the footage and then try and figure out how much worse the loss of life could have been. The thing that amazes anyone who saw what happened is the speed of how the fire spread. From discovery to the entire stand being engulfed in flames is under 4 minutes. The below footage is what was broadcast on the day. It was copied from the original archive version from Yorkshire Television. It does contain some distressing images. One of the striking pieces from the film footage, that shows how hot the fire became, is one of the policeman’s hair spontaneously bursts into flame. A strange, but simple, demonstration on how hot the fire became in such a short period of time. After the fire, the enquiry on how it began started. The Popplewell enquiry. This enquiry banned the construction of any new wooden stands, banning smoking on existing ones and closing any unsafe stands that were standing. The Bradford Disaster Appeal Fund, was set up within 48 hours. The appeal finally raised over £3.5m. Events included a re-staging, using the original starting line-ups of both teams, of the 1966 world cup final. This match was won, for a second time by England but with a scoreline of 6-4. A version of Gerry & The Pacemakers hit “You’ll Never Walk Alone” was released to raise funds for the appeal.